I was introduced to dowsing by my brother-in-law in 1969, an architect and surveyor. He made regular use of it for locating things on building sites. I was building up a business at the time after being made redundant from the heavy vehicle industry and having three children going through the education mill etc. Dowsing, I regret to say, had to go on the back burner for the time being. I did dowse from time to time but it wasn’t until a stroke of luck 20 years later led to an invitation to dowse at the Cressing Temple Historic Monument site in central Essex that started me making serious and regular use of it. The invitation had come from the late Mike Wadhams, Historic Buildings Adviser to the Essex CC following an expensive geophysical survey which had produced disappointing results. It was a second stroke of luck that the resident archaeology team on site consisted of Tim Robey MA, Site Archaeologist and Katherine White, Assistant Archaeologist. After a cautious welcome they took a serious interest in everything I did and could not have been more helpful. After a year Katherine left to take a PGCE and teach and Barry Crouch was appointed in her place. He too took an interest in the dowsing. Also taking an interest, if only from a distance, was John Hunter, at that time Deputy Planning Officer of Essex CC with overall responsibility for archaeology. All this was in pleasing contrast to the chilly reception I got from the County Archaeologist, a noted sceptic. The Archaeology Office at the site was closed at the end of 1997. Tim is now lecturing in the Wessex-Avon area and Katherine is Education Officer at Trowbridge Museum. We keep in touch. Barry is now Senior Technical Officer at County Hall in Chelmsford but without any direct responsibility for archaeological matters. In 1999 Barry decided, at rather short notice, to use my dowsing at Cressing Temple as the basis of an empirical study into dowsing and archaeology which he submitted, successfully, as a thesis for the post graduate diploma in field archaeology. He received a good mark and was complimented on not being afraid to tackle a controversial subject! There is a copy of the thesis at Sycamore Barn. It is all very basic stuff, but for me, the experience was an ideal introduction to dowsing for archaeology. What really set my future course, however, was getting out into the surrounding fields and coming to realise the potential that exists for landscape dowsing. In the field known as Dovehouse, which is part of the Cressing Temple complex, some of the features that I recorded have emerged from subsequent excavations. One particular feature that hasn’t yet been excavated, but caused much head shaking (mine included) when I recorded it on a site plan in 1994 was what appeared to be a series of seven concentric rings of post holes. I spent much time on it with two other dowsers on various occasions but it wasn’t until two years later in 1996 with the publication of the findings of the geophysical survey at Stanton Drew that I was able to convince myself that perhaps I was right after all. The Dovehouse Field feature is quite remarkably similar to, though smaller than, the Great Circle rings at Stanton Drew but, of course, without the standing stones. Just in the few areas that I have been able to cover so far I have been fascinated by the amount and variety of archaeology that seems to be all around us. Yet the eastern counties of England have relatively few accredited prehistoric sites despite the fact that Colchester is the oldest recorded town in Britain and Maldon on the Blackwater estuary the oldest known port. There are probably two main reasons for this. 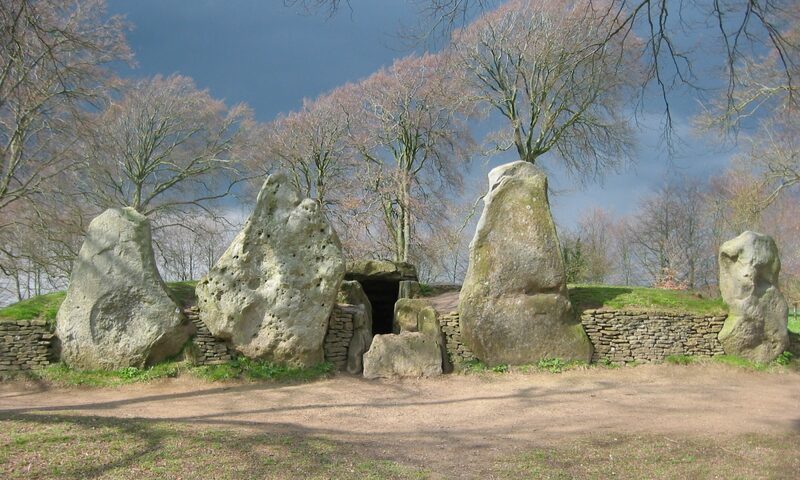 First, there is no natural stone nearer than Northamptonshire and the Lincoln-Cambridgeshire border area. Although tales of ancient stone monuments exist in local folklore, none have actually survived, any stone having long since been recycled. Second, East Anglia and Essex have “good strong land” and have been well populated and farmed since the late Neolithic times. Repetitive arable monoculture and the use of heavy machinery in recent times has effectively obliterated most of whatever archaeological features may once have been visible. Dowsing is surely the only means available to us to go looking for them? The difficulty and frustration of dowsing arable land lies in the limited time available in which to get out there. It is confined, largely, to the winter months, and while it was easy in the dry years of the early nineties, the wet winters recently have often made it impossible on the heavy land in these parts. Within a mile of where I live, rod and pendulum have drawn me to what I believe to be, a nine ring post hole circle similar in size to the great circle at Stanton Drew , the site of a series of Bronze Age barrows, a Roman military camp overlooking the valley of the Colne River, and a small villa site. And they are just a few. But doubts continued to niggle me so the following week I went back and found that Martin and I had both been “right” in that the dowsed outlines of a second cursus emerged along the banks of the River Pant in the direction Martin’s rods had indicated. It was about 100m long and 30m wide and, I have no doubt, the earlier of the two. A salutary experience indicating just one of the pitfalls one can so easily fall into when attempting to dowse landscapes. When people settled in a locality, and in specific locations they did so for reasons. If a site was thought to be a good place to settle in one era, it was probably equally good in another, with the result that there are often several layers of settlement on individual sites. As with water dowsing it is absolutely essential to be able to focus on different levels. The problem whenever you find things is how to substantiate them. It costs money. I am presently trying to persuade our lively and active local Heritage Society to apply for a grant under the National Lottery Local Heritage Initiative to facilitate a dig on part of the village playing field. Has anyone any experience of bidding for funds for archaeological purposes? A geophysical survey of the field in 1995 carried out as part of an Historic Towns Assessment programme failed to locate the site of a hospital and chapel, which are recorded as having been built by the de Vere’s, Earls of Oxford, of Hedingham Castle in the 13th century and are known to have stood in the field. I was asked to dowse it in summer 2000, and have drawn up a site plan. At the instigation of a neighbouring farmer, who is also a local historian and archaeologist my current project is to try and throw some light onto a problem that continues to defeat archaeologists and historians, namely establishing the route of the missing sections of two important Roman roads that are known to have run through this area, heartland of the Boudican Revolt of AD.60. The roads must have had an important strategic role in the Revolt itself and it’s aftermath, about which much has still to be learned. The weather throughout the autumn and winter, and then Foot & Mouth effectively closed most of the landscape down till mid May seriously restricting my movements. Although it is early days, it is proving a most interesting exercise, the picture that is beginning to emerge being significantly different and more complex than the official record.